Some curious Stoic passages which attribute doctrines or guidance to the god Zeus. It is wise, not listening to me but to the Logos, to agree that all things are one. Heraclitus’ cryptic Greek, in the passage above, can be read as implying that it is as though the voice of Nature, or Zeus, were calling us saying “all things are one”, and that wisdom consists in echoing this, in our own thoughts and words. Is he attributing these words to the divine Logos, to the voice of Zeus? The Stoics, who followed Heraclitus in many regards, also appear to attribute certain doctrines or phrases to Zeus, to God, or to Nature – all broadly equivalent terms in their pantheistic worldview. For example, Musonius Rufus taught his students that Zeus “orders and encourages” us to study philosophy. It appears to express perhaps the most fundamental doctrine of Stoicism: that “the only good is moral good”, or that the essence of the good is virtue. Being a good person and having a good life are synonymous for the Stoics, in contrast to the other philosophical schools of their period. So Zeus says: ei ti agathon theleis, para seautou labe or “If you wish any good thing, get it from yourself.” That obviously resonates with what Shaftesbury called the “Sovereign” precept of Epictetus’ Stoicism: “Some things are under our control and some things are not.” From this a twofold doctrine emerges: (1) the good resides squarely within our sphere of volition, in moral excellence or virtue (2) external events, beyond our control, are indifferent with regard to our happiness and wellbeing (eudaimonia). As we shall see, this twofold doctrine is repeatedly attributed to Zeus himself by Epictetus, alongside the claim that it is something that anyone may discern through considering the basic “common sense” facts of human nature. The “law” of Zeus is elsewhere defined as (1) to guard what is our own, our reason and faculty of choice, and make good use of it; and (2) to not claim as ours what is external, or yearn for what fate has denied us, but to be willing to give up what fate has temporarily “loaned” us, as Epictetus likes to put it. Again, Epictetus insists that Zeus himself has given them guidance. Perhaps recalling Heraclitus (“Listening not to me but to the Logos…”) he therefore insists the students present should listen to the guidance of Zeus and not to their mortal teacher. Again, the word of Zeus, embodied in human nature, clearly encapsulates the basic Stoic doctrine (“Follow Nature”), which divides into the twofold injunction: (1) Protect that which is your own, your reason, volition, and virtue; (2) do not grasp after that which is external, and belongs to another, or to God. Of the things that exist, Zeus has put some in our control and some not in our control. In our control is the most beautiful and important thing, the thing because of which even the god himself is happy – namely, the proper use of our impressions. Such use brings freedom, prosperity, serenity, and stability; it also brings justice, law, self-control, and complete virtue. All other things he did not put in our control. 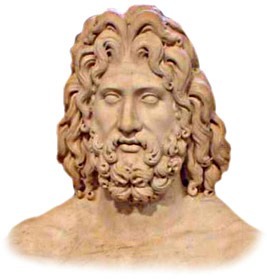 Therefore, we must agree with [Zeus] the god: after we have divided matters in this way, we must concern ourselves absolutely with the things that are under our control and entrust the things not in our control to the universe. And whether it be our children, our fatherland, our body, or anything else that the universe demands, we must yield them readily. Moreover, there are a couple of other cryptic passages in which Epictetus appears to attribute certain doctrines or sayings to Zeus. First, “let the better always prevail over the worse”, which seems to be taken by the Stoics to mean that the Divine Spark in man, his volition (prohairesis), is inherently able to overcome external impressions, through the faculty of judgement. There’s also a peculiar passage in Book Nine of the Stoic Lucan’s epic poem Pharsalia, about the Great Roman Civil War. The Stoic hero Cato marches his beleaguered troops through the deserts of Africa, where they endure many hardships, and suffer many casualties. However, they are inspired to persevere in the face of great adversity by Cato’s example. At one point, Cato’s army come across the only temple to Jupiter (or Zeus), under the name of Ammon, in the surrounding lands. A general who had defected from Caesar’s army, Labienus, urges Cato to consult the oracle about their fate in the civil war. However, Cato refuses to do so, because of his Stoic principles, and instead becomes a kind of oracle himself, delivering a short speech on Stoic doctrine to reproach and inspire his men. to meet my death in battle, free, to witnessing a tyranny? things commendable and whether what is upright never grows by its success? and sky and excellence? Why do we seek gods any further? leaving Ammon to the peoples, uninvestigated. So Cato is portrayed as saying that he does not need to consult Zeus in a temple. Zeno reputedly said that the ideal Stoic Republic, incidentally would have no place for temples. Zeus is all around us, in whatever we see or hear. Moreover, he has planted the seed of virtue, knowledge of our goal in life, within us, including the clue that death is certain for all men. It’s only what we can know from within, without depending on external sources of information, that’s of absolute moral importance – otherwise such knowledge would lie in the hands of fate rather than within our own power. Perhaps because we depend only on ourselves for knowledge of the good, we can grasp it with complete certainty, which provides wisdom with a special security or stability, once attained. Wretched as I am, I must follow still. Fate guides the willing, but drags the unwilling. Fine job! Please use more and more the word ‘prohairesis’ and abandon the word ‘will’.